Whether you are looking for an Accounting Software to work across Multiple Stores or Sites, now you can get totally customized software in accordance with your business models. There are lots of benefits of getting Customized Software Developed to work across Multiple Locations and effectively the Software works as per your business model and not Vice versa. Whether you are setting up new business, expanding your existing business or just want to computerize all your day to day business activities, our customized software development services from Goa can provide you the benefits of computers. Whether you are running Multiple Stores anywhere in Goa, Running single or multiple Factory Outlets, or any other type of Business in Goa, you can get hire our software developers without worrying about their programming and other skills and let them develop the best customized software to help your business grow. In order for a Software to work across Multiple Business Locations, all the locations need to be connected. Internet is really cheap way of connecting computers across network and once your multiple stores or locations are connected using the internet as a network, you can share any type of data, do remote monitoring or anything else. Whether you need to have customized Accounting Software which can be learnt by your staff easily and works as you want the software to work, our Goa based office is equipped with all the latest technical innovations to provide you complete software solutions. Our Customized Software Development costs are to be paid only once and there are no recurring charges and yes you do get the complete source code of the software application developed. In case your customized application does needs access to an online database to share data across multiple stores, you would need to pay a small annual fee. Our Software Development Company in Goa provides software development services for Windows, Linux, Macintosh and Android and we are also expanding our services to incorporate Windows 8 Phone Application Development. Normally Software Applications share data across network by storing the data to be shared on an external computer connected to Internet. The External Computer connected to internet can be hired at an affordable cost saving you money to manage your own server and other charges like static ip address, internet charges, etc. 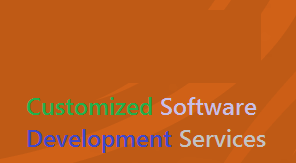 Depending on the type and functionality expected out of a software application, the software can be used across Windows, Linux, mac or any other computer. You can either get a Web based or a Desktop Application to work across Multiple Network Locations such as Stores, Factory Outlets, etc. Customized Desktop Applications working across Multiple Locations provide easy user interface and often save time and efforts of the users using such Desktop Applications. On the other hand a Web based Application provide your Accounting or other Functionality to work across Multiple Platforms such as Windows, Linux, Macintosh, Android or even Windows Phone. Whether you need a Desktop Application with Network Support or a Web based Application to work from Multiple Locations, Computers or even different platforms, Contact us today or visit our Goa office in Panaji to get Application Developed with your Logo, Database for Accounting, Reporting , etc to work across Multiple Stores. We even provide Electronic Automation Services, SMS Controlled Computer Services, GPS based System Solutions and all the technologies can work together to provide you the the complete customized software solution. We also provide other software services, please feel free to browse through this website to know more about our software development and website services.